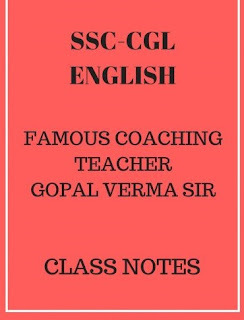 We are providing you Class Notes of English of Gopal Verma Sir, a famous teacher of English, which are very helpful and easy to understand for both Hindi and English medium candidates. You can download these notes by paying just 49 Rs. If you buy these notes today you will also get PDF of 100+ Cloze test for Free to practice worth 30 Rs. After paying, you will get pdf book of class notes in your same email id within 24-48 hours, which you mention during making payment. If you have any doubts and queries, you can msg us on our Facebook Page or comment below in comment box. This section is toughest in all the sections, 45 questions which carry 180 marks. 39 Years’ Chapter wise Topic-wise Solved Papers (2017-1979) IIT JEE Physics by DC Pandey. Modern Approach to Chemical Calculations R C Mukherjee.